The latest Aladdin trailer unveiled Will Smith's Genie in all of his blue glory. When some first-look photos from the movie were released late last year, many Disney fans were upset to see that Smith's Genie was not blue. The actor explained on social media that he was pictured in his human form and assured that he'd be CGI for most of the movie. Now, fans have what they were asking for and a lot of them are freaking out at what they see. Disney's decision to make live-action versions of some of their classic movies has met some resistance, and Aladdin is no different. The animated movie is beloved by Disney fans and Robin Williams' take on the Genie is iconic. However, after the success of the live-action Beauty and the Beast, there was no stopping the studio and they are continuing on with the remakes, hoping to reach as many people as possible. 2019 will see three of them hit theaters, including Aladdin, Dumbo, and The Lion King. 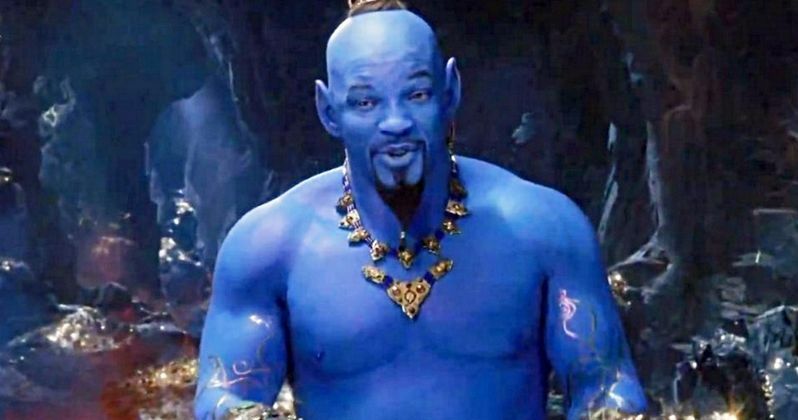 Now that Will Smith as the blue version of Aladdin's Genie has been revealed, there are more than a few people who want him to go back into the bottle. YouTube blogger Jenny Nicholson said, "Will Smith Genie is what appears in my room when I have sleep paralysis," which was just the tip of the iceberg as far as social media is concerned. "Everyone at Disney is high on bath salts and this image is making my brain feel haunted right now," said another person on Twitter. You can read another particularly brutal reaction below. "The Will Smith genie makes me feel the same way I feel when a celebrity dies: Nauseous, sad, and like I can't wait to tell everybody about it." After seeing the Aladdin first-look photos, it's unclear what Disney fans thought we were going to get. Even after The Lion King backlash over the CGI vs. live-action debate, Will Smith's Genie is getting a ton of mixed reactions, with more than a few comparisons to David Cross' Tobias Funke from Arrested Development. There are some people that feel that Smith looks good and that he'll be pretty crazy version of the character once the movie hits theaters. Will Smith talked about the taking on the Aladdin role and admitted that taking on such an iconic role is "terrifying." He also added that he was going to throw some hip hop flavor into the role, which has more than few people nervous too. But, in the end, Disney looks like they've made something pretty massive, as seen in the trailers. Though the blue With Smith genie is rubbing some people the wrong way, we've only seen a few seconds of footage. We'll just have to wait until Disney releases some more footage. Until then, you can check out some of the better reactions to the Genie below.